Yay, I'm back with an extra long post. It's equivalent to two parts, so enjoy the read. Well, I think it's only fair I make up for my absence by starting on the next one, but we'll see how long that takes me. Talk about a disappointing lack of efficiency. Why does this always happen... no, wait, I know the answer. But I'm not going to say the answer and instead blame Larry, because something smells and it's usually the Butz! Now get to reading. I submitted two extra long posts together, so you'll have a little more stuff to read. Why has there been little to no activity on this site in general? Is it because of the holidays? Is it because of those bothersome people like me who have nothing better to do than procrastinate on jobs they set themselves? Is it because I think too much? Also, I was going to say I want a copy of DGS when it comes out, but that's going to happen whether you grant it to me or not, so never mind. Thanks for all the happy days and nights! I assure you this new round of reorganization will not affect my update cycles (because what would?). Old Man: So I was looking for a job! I’m buying a lot at the moment. I need spending money. Old Man: I don’t go to that restaurant for food. I just go for the javaccino. ’-> He even mispronounces “coffee” as “coshee”. Well, one look at his dialogue tells me he’s completely old school… uh, wait, I don’t need to look at the script to tell me that. The 'mispronuncation' is part of his Edokko image. To native speakers of Edo dialect, there is no distinction between the ヒ and the シ. ヒ therefore often is pronounced シ (for example: 東（シガシ),　コーヒー（コーシー), 百(シャク）、昼（シル）) . The switch other way around occurs occasionally, but is much more rare (質屋（ヒチヤ）). Thanks, good to know. And here I thought you abandoned me long ago because I didn't hear from you in a while. :P Revised and we are a-go. No news is good news, or something like that. In hindsight, maybe I shouldn't have waited another 2 weeks to update, especially after this last post. The irony is strong. Fortunately, I have two parts up at about the same time, so we're all good here, yeah? Yeah. Oh, yeah. And if there's anyone who cares, I started on a new fanfic. Me and my undying love of Journey to the West is responsible and in no way regretful. -> To a lesser extent in Japan, of course. This craft basically “proves” he’s a native to Shitamachi. Maya: A code word? Hmm… … Sesame! ’-> And the first one she gives is ‘yama’. ’-> Her second guess is ‘kawa’. Yeah, choosing some of the most commonly used kanji in names always makes a good password (not). ’-> It’s called “Karyouze” in the other one. ‘karyou’ can have several meanings; one of which means “good, favorable, successful”, another that means “minor fine”. It’s supposed to give off a feeling similar to “Tender Lender”, being lenient with charges and all that. It's カリヨウゼ　(not カリョウゼ), so 'Let's Borrow'. 三日坊主 is a common saying, meaning people who can't stick to anything/don't have any perseverance. It literally means someone who is a monk for three days. It is such a common saying that doesn't seem to have any relation with the financial business, which is why Naruhodo is pondering why it's hanging there, until Urami explains it has a different meaning here. ’-> Mayoi: Daruma-san sure is mighty. No matter how many times he’s knocked over, he’ll always stand back up! だるまさんがころんだ is a children's game. I wouldn't say this bit of dialogue is a particular reference to this game, but given who's speaking, it's well plausible that she would have thought of that. Thanks, I'll add it in anyway. The rest seem to be in order. Now even I have to wonder about what I was talking about at the end there. Does it mean I have to go through with it and mess around with Freudian psych? I'm not sure if it's such a good idea, though... in case I make anyone uncomfortable. On another note, I've updated my other blog with new stuff. Or, you can just click the link in my sig below to head to my FF.net page instead. Though this may not be the next case update, I have something I'd like to share with everyone. Click here! And witness how I waste my free time thinking about this stuff, hah. Last edited by Rubia Ryu the Royal on Tue Feb 03, 2015 4:49 pm, edited 1 time in total. You know, there's one thing that has been bothering me ever since I've read that article by Janet Hsu. Is "Japanifornia" supposed to be the nickname of the place where the localized games take place? As in, Japanized California? Because before reading that article, I had always assumed that "Japanifornia" meant "wherever the game is taking place i.e. Japan for the Japanese version and California for the American version (and France for the French version)." It's merely a preference for what to describe this setting the games take place in, but I'm just suggesting that in hindsight, there's much more to the name than simply being a name. It may not have started as anything but a silly nickname, but over time, it begins to develop into something much more. And on that thought, it reminds me of something I noticed in the depths of Turnabout Quiz. One certain puzzle involves artifacts supposedly from the "first World War", which supposedly implies that there's a "second World War". In terms of the original Japanese version of the games, their history is very much true to our history. It's only by coincidence that Turnabout Quiz wasn't localized - obviously not because of that particular puzzle - but the fact that it wasn't actually helps to bolster my theory. I take it as a convenience. Next part up. I'm serious this time. Serious as Missile with eyebrows here. It just so happens to be February, ain't it? My timing couldn't be more perfect. Edit: Whew, 4000+ views. My little fanbase is growing ever so steadily. I couldn't be happier. Aaand, here's the next one. Ooh, a Japanese reference! He says “ナゾはミステリー” (“The puzzle is a mystery!”). There was a popular quiz-variety talk show called 謎を解け！まさかのミステリー (“Solve the Puzzles! The Unexpected Mystery”) that ran from 2003 to 2006. The contestants would be given a theme to follow and a question based on it, with the host leading the discussion. The catch is, the person who gives the key hint to the mystery is hidden among them, and the person selected to solve the mystery has to pick up on it. The answer is then revealed. It is not a reference to the show (just the words 謎 and ミステリー don't make up a reference, and the exact quote does not appear to have been used as a catchphrase or anything). Also; that show started late October 2003, while GS3 was released in January 2004. Factor in production time and by the time the show started, the game was probably just about finished and ready for printing. ...I still wish they didn't go with that font because the original looks so much more... elegant. But that's just me. And I'll ask here too. I have GS4, GK1, GS5, and Ghost Trick lined up after I finish with GS3, but I'm hesitant to move on with the mess in GS4 and GK1's scripts. GS5's is all set, and GT's should be coming soon enough. Which of these would you guys like to see first? No one's answering my question. You guys make me sad. Next part is up anyway because I still wuv you all. About time I returned, yeah? Sorry about the delay! I've been filling my appetite for GK2 and Dangan Ronpa 2 these past couple weeks... and I still haven't seen many more answers. Phooey. Final part is finally up. Now I will burden myself with the job of reorganizing this massive blog to match the latest standards of browsing convenience. Hooray. Speaking of which, I'll get started on that Turnabout Shojo Combination CD drama. In the meantime, there's this other thread with a localized translation of the GK2 CD drama, Turnabout from Space. Congratulations with finishing the original trilogy! Alt: Motozuka Kazutomo, written last-first; last name has the kanji “本家“. Wondering whether you aren't confusing 本塚 with 本家 here. By the way, regarding that segment with Viola in the credits, did I get that interpretation right? I don't exactly remember why she would lend him that particular amount, since he never actually agreed to take out a loan. The game script I found did sadly not include the case in question, and I haven't played it in a while, so I don't know about the money. All I do know is that both times I played that case, it was clear to me that she referred to Phoenix. In fact, I specifically replayed it at a later point because people on the internet kept talking about how she referred to Tigre, and I wanted to see if I had misunderstood something, but even on replaying, it seemed to me that she was talking about Phoenix. I would have to replay it again to give proper context for how I reached that conclusion, though. Finally got around to setting up a master post and a link to it on the main page. Also, I'm cutting off all votes today, but only until the next round. By that, I mean these votes will carry over to the next time I hold the poll, after I've finished with the following game. 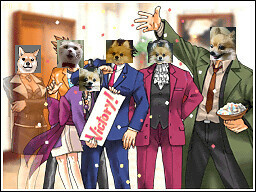 Congrats to Gyakuten Kenji / Ace Attorney Investigations for a landslide victory...ish. Today's updates have nothing to do with the blog (or the other one, for that matter), but I recommend checking it out. It took me a lot longer than I'd expected to tidy ends up, thanks to a bad connection. If you would like me to continue this line of work, then feel free to leave your comments below! If not, I'll get right back to the actual blog work. Another update for the blog. I've made browsing through my massive blog just a bit easier. Now each of the blog project posts have links to the next part, so if anyone wants to read through them in one go (for whatever reason), they can without having to rely on the master post. When I get more ideas for how to reorganize this blog, I'll let you know! Edit: If anyone's still interested in my character role language reports, I've returned to them~ Go check it out! Yeah, I went there. I took an entire web page as a challenge for my translation practices, and the DGS hype never seems to end. I think I'm just about done with DGS now... until tomorrow, anyway. Yay, after a two-month hiatus, this project is back in session! Of course, I explain my reasons why I took so long in the latest post, so check it out here. I've only played 1 ~ 3 in English, so from this point the English script is all new to me. I see a lot of these names for the very first time. Simply put, 狼 is “wolf”, “士“ is warrior, and “龍“ is dragon. “Dragon Warrior of the Wolf Clan” sounds kinda impressive, doesn’t it? This one hit me like a brick, ow. “Shina” is actually the Japanese phonetic transcription of “China”, written as 支那. The term is pretty archaic in usage and no one uses it due to its slightly discriminatory history, so you shouldn’t either. Actually, you occasionally still see 支那そば (= ラーメン). His name comes from the phrase “nakama to shinjiru”, or “to believe in one’s friends”. Even the term 仲間, ‘nakama’, is in his name. His localized name gives the same meaning. More precisely (also in the context of the story), 'believe to be a friend'. と =/=　を. This is one name Japanese fans feel sorry for. Akubi, written as 悪日, means “unlucky day”. If written as 欠, it’s the kanji radical for “yawning”. Gee, I wonder who else has been very sleepy. あくび is a yawn, hicks is the English word. Shiraoto is made up of the kanji for “white noise”, aka static noise, to mimic her tendencies to hit the snooze button. Wakana normally means “young greens”, but here, it refers to her sweet and childish nature. I suppose they didn’t need to come up with anything else, since all the spoilers came from Hicks’ name. しらね、わかな =　知らない、解らない. Or　しろうと (素人), as opposed to Konomichi's character. Not sure, but 丈＋一 = 天.
Ogura probably comes from ‘ogurai’, which means “dim, shady” in contrast to a name like Amanogawa, which spews grandness. The ‘sumi’ in his name means “clear, serene”, and the ‘ma’ emphasizes it. Quite contrastive with his last name, but makes sense in hindsight. According to C-R, her Japanese name comes from the tale of Orihime and her lover that’s celebrated during the Tanabata Festival. It’s a tale of star-crossed (pardon the pun) lovers separated by the Milky Way and fated to only meet with each other once a year. In other words, both father and son were the barrier keeping this princess from meeting with her true love, and when said crimson-clad knight enters the stage… he’s totally oblivious. Yay, happy ending. お　と　め　＝乙女 (her personality). I’m not really sure about this one. Mt. Akaishi sits smack dab in the center of Japan as one of the highest peaks along the aptly named “Japanese Alps” that divide the central island of Honshu (the largest region of Japan). And this guy so happened to be caught right in the middle of two warring sides. I’m guessing Aoi was picked to play with a color duality, “red” and “blue” (which is written as 青). The same word for “blue” can also mean “inexperienced”, as this guy is only a Mask*deMasque ripoff, rather than the real deal. By the way, his localized name is purely a pun on the word “casino”, given his gambling endeavors that ended badly. It has nothing to do with his Japanese name. Thanks as usual. I've edited the post. I gave that explanation based on my searches through a Chinese dictionary, and I understand a bit of the historical context behind the term, from the Chinese perspective. Of course, I don't really hear of any issues surrounding the term these days, but I figured it wouldn't hurt to mention as such. Thinking it over again, I've decided to remove that line from my post, since I don't need it there anyway. hicks is the English word. I dunno about this one. He's certainly no country hick, and I doubt it's based on the word "hickeys". He had a wound to his head, but I don't remember any mention of other marks or bruises on his skin. Just wanted to say I'm still following this.And yes,the AAI characters sure have some odd name puns. It's also usually avoided in Japan, but the example I gave is one of those exceptions. Not widely-spread-common, but don't be surprised at seeing 支那そば sometimes. Sorry, I meant to say it's the English word hiccups. So a yawn & the hiccups. In the meantime, I'll be figuring out a way to get back into this one. I needed a break from tumblr anyway.